What is the good news about the specialty food industry? It’s a gifting business. What is the bad news about the specialty food industry? It’s a gifting business. The bad news is obvious. Gifting is Christmas. Sure, we get a bump at Valentine’s and Easter, a few others – but 98% of our clients – that’s all but one – make over half their year in an 8 week period of time. Such extreme seasonality presents a whole host of challenges. Erratic labor needs, production and inventory issues, tricky cash flow. It’s a tough model in many ways, and one we’ve all tried to flatten over the years – with minimal success. Now for the good news. If you remain special, your specialty food business will always have a place in an Amazon world. If you missed it – take a look at our newsletter a couple of months back about why our industry has protection in this predatory environment. Why Specialty Food Will Thrive in an Amazon World It’s like this in a nutshell – if I want to send a box of Vosges Chocolate to a friend, I want it to come from Vosges. I don’t want the word “Amazon” anywhere in that picture. Even if Amazon had a good inbox experience – which it most certainly does not – why would I want to send a box of Vosges from anywhere else but Vosges? If I was someone that absolutely had to have a box of Vosges on hand at all times – perhaps I would be attracted to Amazon’s easy, one-stop-shop, experience or it’s brilliant auto-ship program. Maybe I could find it a bit cheaper (though this is rarely the case). I might buy Vosges on Amazon in that case, but I don’t regularly treat myself in such a way and when I do, I hide it in the pantry and parcel it out slowly while the kids eat the Hershey’s. That’s a long way of saying that “specialty” is largely a gifting business and it isn’t supposed to message “quick, convenient and inexpensive” and I sure as heck don’t want my gifts to either. So I’m three paragraphs in and I haven’t even gotten to the point of the story – which is this: be special, stay special or become special if you want to make it in specialty food. What is one of the most important – most attainable – yet most often overlooked “awe” qualities in mail order? The inbox experience. Roll your eyes if you must, but the inbox experience, from product packaging, to the mailer box, can stand between obscurity and visibility. Let’s talk packaging. Think about this. How often do you choose a gift based on packaging? More than 80% of consumers say that when buying a gift – packaging is just as important as the product itself and 60% say they have purchased a food gift based on packaging alone. Why? It’s a materialistic world and first impressions mean everything. A friend of mine who is a higher up at a well-known, designer-brands, discount retailer, says their specialty food items sell like hotcakes, if you’ll excuse the pun. In their customer surveys they have found these items sell well because their customers report buying them in bulk and giving them as gifts. Why? Either the brand, or the packaging makes the gift look expensive. Never mind the chocolate inside might be pushing expiration and the sugar bloom has turned it white and dusty. Now, dedicated specialty food buyers are not typically the bargain-at-all-costs kind of consumer. But this example speaks volumes about what most all gift buying behavior looks like across all price segments. Move it up to the high end of things. If I’m buying a box of Debauve & Gallais Chocolate, I downright expect my recipient to be blown away. Point is – wherever I am buying, I want my gift to impress from first sight, and so do our customers. Now let’s talk “outer box”. In mail order, the packaging isn’t the first touch point, the mailer box is. Does it impress? Is it unique? Do you get excited before you even grab for the scissors? As long as all of us around here have been in the food business, it is still surprising to see just how important that total package experience really is. Last week we talked about the order project our office manager took on during the holiday. Robin ordered from thirty-one specialty food companies and among the many pieces of insight we gained was that inbox experience trumped everything. If the shopping experience had failed to impress, a well-done presentation made that almost insignificant. If the presentation failed to impress, a well-done website meant little. The most important question we could ask Robin at the end of the experience was this; ‘how likely would you be to send each test-order as a gift?’ On a scale of 1-10, 10 being the highest probability, only two items were ranked with a perfect score. Robin said that determination was based almost totally on presentation. Your most important marketing tool is what arrives at your customer’s door. If you are a gift giver – you’ll gauge gift worthiness on your own ‘wow’ experience. But how do many of us become gift givers? By being gift recipients. I am a copy-cat gifter. Perhaps I am a lazy shopper – but I rifle gift ideas almost exclusively based on gifts people have sent me. If I receive a gift that excites me, I can be certain it will have the same effect on friends and family. I collect gift experiences and replicate them discerningly because what I give, reflects on me. I think Robin’s stats are pretty accurate. Out of all the companies she purchased from, only the top 10% would get her repeat business. Thank God for individual tastes and personalities because top 10% would be a fairly lofty goal if that was a purely objective bar. BUT – I will say this; seeing those gifts lined up – side by side, I can pretty much guarantee there would be little subjective deviation if we had 20 Robins placing and ranking the orders. From this exercise, we can define a good inbox experience as clean, branded, attractive and anything that stands out. 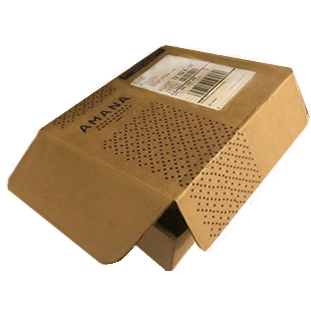 In some cases, that was a bright pink box – or something as simple as a large, bright sticker placed on the shipper box. We found fun, multi-color shreds to be a nice surprise as you opened the parcel and we liked to see colorful, creative box inserts that introduced the brand – almost like a teaser for what comes next. For packaging, we liked anything that was either classic and beautiful, fun and funky, eye-popping, sleek, expensive looking, well-constructed or unique. In other words, it wasn’t as much about the creative angle as whether or not it made an impact. What we didn’t like was thin, drab-brown mailer boxes that looked beat up and broken down with no branding or differentiation of any kind. We didn’t like mailer boxes that were way too big for the inner box. We didn’t like opening a box to find items seemingly thrown in. We didn’t like packing slips to be the first thing we see – they should be at the bottom under the product. We didn’t like packing material that looked messy – we prefer shreds to messy Styrofoam peanuts. We didn’t like boring packaging that had little or no-gifting quality whatsoever and we didn’t like a large, salesy coupon staring us in the face before we got to the gift. Even if a package is for self-consumption, brand impression starts with brand appearance – not with promotion. Our largest takeaway from all this was that premium packaging doesn’t have to come at a big cost. It doesn’t have to be gilded in gold leafing and trimmed in satin or etched with fancy engraving. And it doesn’t have to be ordered in mass quantity from Far Asia 9 months in advance. As we started to research some of the high-rankers, we found that price actually had little to do with it – if you’re smart about it. Reach out if you want more details – we are happy to share. Below is a heck of an example of smart, clean, branded execution. This was a perishable order and the items themselves weren’t separately boxed. Even so – the shipper box was so lovely, and made such a statement, it didn’t need inner packaging. 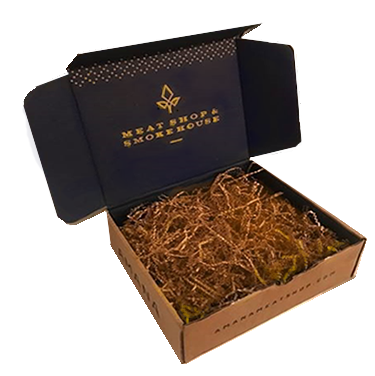 The box was a heavier weight, displayed the company name on the top and on the side, opened cleanly with little effort, hinged on one side like a gift box and had a beautiful, rich navy blue interior with a logo emblazed on the inside. It was the appropriate size for the items and shreds were used along with ice packs for refrigeration. Genius. And totally attainable. This concludes our three-part series on measuring value. Whether it’s the value of your customer, or how they value you, the value of your marketing dollars will be in close keeping. Measuring these things is the first step, reading and understanding the results is the second. It’s the third step businesses often want to skip over – leaving gaps that even good marketing won’t be able to fill. As in all things, it’s what’s inside that counts.